The Phil Donahue Show. Nearly 7,000 shows were aired from 1967-96. See a clip here with Milton Friedman. The National Review Years, July 25, 1980 — The nation is in the grip of rampant Philophilia — the unnatural love of Phil Donahue. Liking him is one thing; how can you not like Irish charm, even after filtered through a generation or two of Americans? But loving him: waiting months for tickets to his show, shrieking at his entrance, hanging on his words: that’s something else again. Phil Donahue’s technique: a mixture of romper-room condescension and abrupt sarcasm. The widely advertised intellectual training is only half the story of a modern college education. The other part is a subtle initiation into a set of trans-disciplinary liberal attitudes, effectively enforced by little more than the tacit threat of minor public humiliations. For most people, that’s enough. The technique, a mixture of romper-room condescension and abrupt sarcasm, reminds me of a professor I had in the Sixties, who never tired of cooing that we were the brightest generation in history. Things went smoothly as long as we agreed with him: all smiles and nods. But lo the poor fool who uttered a reactionary thought: suddenly the hapless student was made to feel like a piece of detritus left over from one of the less-bright generations. The professor’s head froze in mid-nod, he glared silently, then (if he thought meet) delivered a cutting remark. The incidence of reactionary utterances fell off considerably over the semester. Which was my way of discovering that the widely advertised intellectual training is only half the story of a modern college education. The other part is a subtle initiation into a set of trans-disciplinary liberal attitudes, effectively enforced by little more than the tacit threat of minor public humiliations. For most people, that’s enough. Vanity apart — he remains our foremost Philophiliac — his ruling passion is anti-Catholicism. Phil Donahue isn’t a liberal professor; in fact he went to Notre Dame back when it seems to have been a stronghold of orthodoxy; and there, as he tells us in his autobiography, Donahue, he was a dutifully conventional Catholic. But during the Sixties he got irreligion: the Church had failed on the big social issues of racism and sexism, and he began to think for himself. “Now,” he recalls, “my mind was racing.” Evidently it raced very fast, for his thoughts are still a blur. He asks, with the triumphant air of Perry Mason trapping the perjured witness, why babies, who don’t ask to be born, are stained with original sin; how an all-loving God could allow His Son to die on a cross; whether Martians would need salvation; and other stumpers. Take that, Aquinas. Clearly, a man in his mid-forties who would settle for this facile schoolboy stuff wants to settle for it. At about the time his intellect attained its present splendor he was making a lot of money and not getting along with his first wife; but do you think leaving Catholicism was the easy way out for him? Guess again: “I thought ... about the void and how much harder it is to rebel than to just ‘go along.’” We have his word for it. Donahue has to keep proving he isn’t an altar boy any more, as by televising an abortion. Vanity apart — he remains our foremost Philophiliac — his ruling passion is anti-Catholicism. He accuses the Church of being “destructive,” of “retarding growth, inhibiting my ability to reach out.” (Phil is big on growth, and quotes an assistant’s confession that “working with Phil Donahue has been one of the most growthful experiences in my life.”) He can hardly go three pages without a sneer at his erstwhile religion. Now why is this called “leaving the Church”? We don’t say a boy has left home if he goes only as far as the front lawn, and there turns around to throw curses at his parents. The point of leaving is to leave something behind, to go elsewhere. Donahue has to keep proving he isn’t an altar boy any more, as by televising an abortion. All self-censure, said Dr. Johnson, is oblique self-praise: it shows how much you can spare. He doesn’t see that his present vociferations are as tamely conventional within the media as his old formal piety was at Notre Dame. He’s still playing it safe: a moral chameleon. And even when confessing his sexist insensitivities he’s flaunting his new awareness of them. (All self-censure, said Dr. Johnson, is oblique self-praise: it shows how much you can spare.) But he has the fundamental insensitivity of the egotist: he can talk only about himself, and all the people in his life are mere wraiths to him. No reader of his book could accurately describe any of them. Meanwhile he continues in his mission of doing for the housewives what my old professor did for us, the brightest generation in history: by example and ridicule, teaching them to subdue their common sense in favor of mass-media liberal proprieties of perception, concern, speech, and behavior. Helping, in his little way, to make God taboo, with heaps of altar-boy earnesty. Copyright © 2018 by the Fitzgerald Griffin Foundation. All rights reserved. 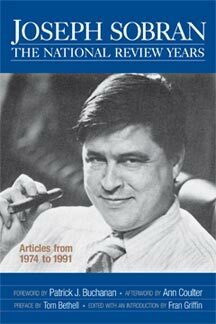 “Acute Philpohilia” by Joe Sobran was published originally in National Review magazine on July 25, 1980. 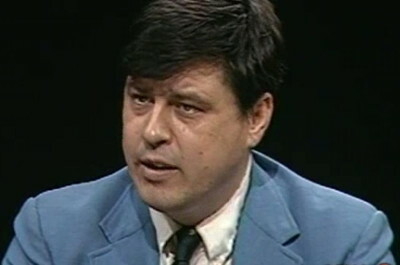 This is one of 34 articles in the Sobran anthology, Joseph Sobran: The National Review Years published by FGF Books in 2012 which the Fitzgerald Griffin Foundation hopes to reprint soon.